Every month or so I will be featuring one of my favorite places, guides or experiences on a separate tab (see above). I hope you enjoy! I am always striving to find unique and out of the way experiences for my clients. A few years ago I stumbled upon an enchanting B&B that exceeded my expectations in every way. Tucked away in the beautiful but rarely visited area of the Marche, you will find yourself miles away from any other tourists and completely immersed in the authentic Italy. 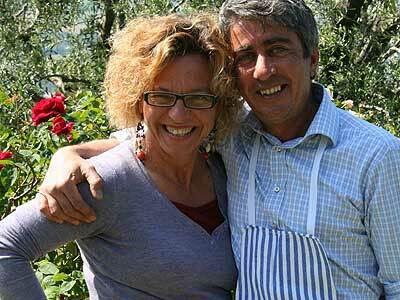 Surrounded on all sides by quaint hilltop villages is the Vento di Rose, run lovingly by Emanuela and Emidio. On my arrival after a long drive from Rome, I was met at the door with a flourish of kisses, a bottle of wine and a light snack. How refreshing to enjoy the scenery with a glass in hand. The property is set half way up a hill giving you great views from their patio. In the spring and fall you will be surrounded by the color and scent of her numerous roses which overflow from every possible corner. crawling into bed each night. 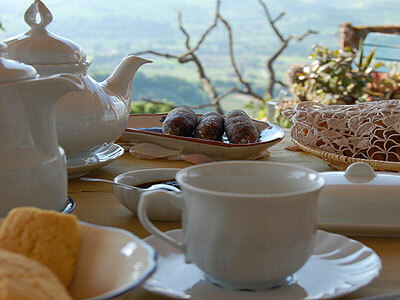 Morning breakfast on the patio overlooking the hillside. Breakfast was my only reason for leaving that bed each morning. In a country that survives on cappuccini and skimpy croissants, the food here is one of a kind. I will never forget the first morning sitting down to an immaculately set table, rose petals scattered across the cloth. I was certain that was the end, only to have them appear with yet another dish. intrusiveness. And now they are providing a fantastic and FREE evening cooking lesson for my clients. and I am always looking for special places. This sounds like one I will visit. How lovely! Please tell them hello from me and let me know if you need anything.